The Automatic Millionaire by David Back – CDs or MP3 download – Save! What’s the secret to becoming a millionaire? 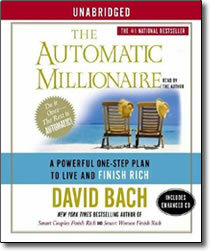 In The Automatic Millionaire, David Bach shares that secret. The Automatic Millionaire starts with the powerful story of an average American couple — he’s a low-level manager, she’s a beautician — whose joint income never exceeds $55,000 a year, who somehow manage to own two homes debt-free, put two kids through college, and retire at fifty-five with more than $1 Million in savings. Through their story you’ll learn the surprising fact that you cannot get rich with a budget! You must have a plan to pay yourself first that is totally automatic, a plan that will automatically secure your future and pay for your present. This one little audiobook has the power to secure your financial future. Do it once — the rest is automatic!